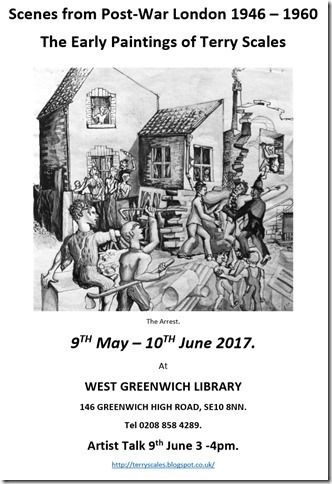 Greenwich artist Terry Scales will be holding an exhibition entitled Scenes from Post-War London 1946- 1960; The Early Paintings of Terry Scales from 9th May - 10th June at West Greenwich Library, 146 Greenwich High Road, SE10 8NN, (tel: 020 8858 4289). 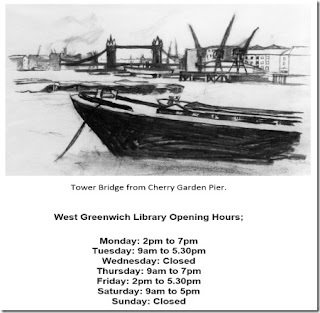 Greenwich Artist Terry Scales worked as a Stevedore on the wharves between Tower Bridge and Woolwich in the 1950's – 60's and his working experience of life in the Docks provided a wealth of insight, material and inspiration for his later drawings. This vibrant collection of paintings, mainly in pen, ink and water colour, reflect the post-war mood of London at the time with figurative images of 'Butlers Wharf', 'Prefab Village', 'Our Gang', 'Canal Scene Deptford', 'Crossing London Bridge' and 'Night Watchman'. They are detailed pictures which capture glimpses of life in the less fashionable districts of our City in that era. They are on display as a group of prints since most of the originals are in public and private collections. The Artist will give a talk in the Library about his work on 9th June, 3 – 4 pm. All are welcome.